Baby corn masala is a classic North Indian style dish with crunchy baby corns in a creamy gravy made of onion, tomatoes, cashews, spices, milk and cream. This gravy tastes quite similar to a makhani gravy but I have not added any butter in the masala. This is quite a rich curry and goes well with roti / phulka, naan / kulcha, jeera rice and mildly spiced pulao like peas pulao or sweet corn pulao. I added some red capsicum in the masala which adds a natural sweetness and together with tomato paste gives a nice color to the gravy. 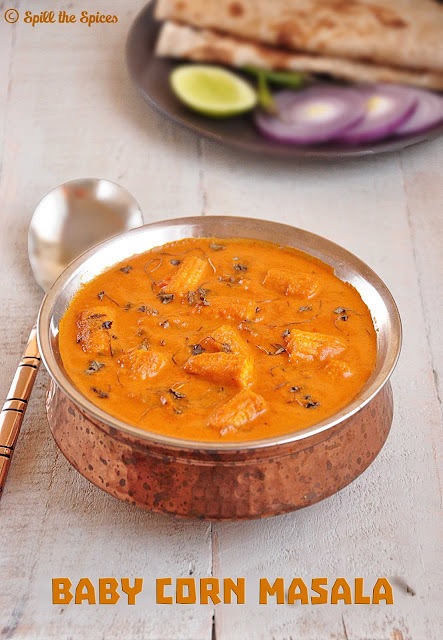 I love adding kasuri methi (dry fenugreek leaves) to any gravy as it enhances the flavor. 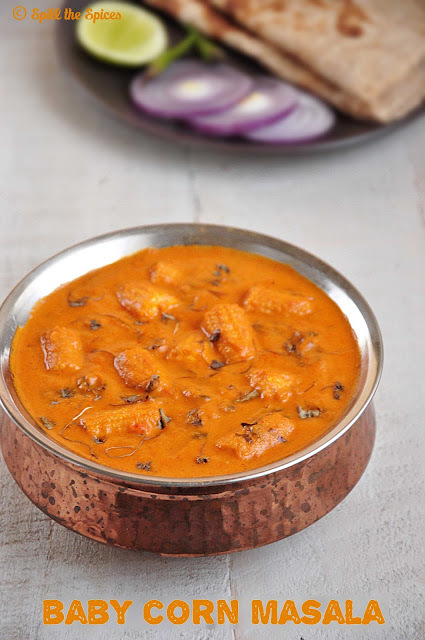 If you are bored of serving paneer butter masala or shahi paneer to guests, try this baby corn masala for a change. As it's very rich and creamy, I love to have with phulkas / roti or jeera rice. Let's see how to make this delicious baby corn curry. 1. In a sauce pan add water, little salt and bring to boil. Add the baby corn and cook over medium heat until it becomes soft, about 5-8 minutes. 2. Drain the water and wash in cold water. Trim the ends and cut into 1-inch long pieces. Set aside. 3. In a kadai, heat 2 tsp oil and add onion. Fry till onion turns translucent. Then add ginger-garlic paste and fry for 2 minutes. 4. Add capsicum, tomato and fry till the tomatoes have softened. Cool and grind with cashews to a smooth paste. 5. In the same kadai, heat 1 tbsp oil and add cumin seeds. When it sizzles add the ground paste and cook covered in medium heat for 8-10 minutes, stirring occasionally. 6. Add turmeric powder, coriander powder, red chilly powder, garam masala, kasuri methi and fry for 2-3 minutes. 7. Add the baby corn, salt and mix. Cover and cook for 2-3 minutes. Then add milk, cream and simmer for another 2-3 minutes. Serving Suggestion ~ Roti / naan, jeera rice or pulao. Instead of cashews, you can use almonds or melon seeds. If you don't have tomato paste, use 3 medium tomatoes instead 2 big tomatoes. If the gravy is too thick, add little warm water or more milk. Do not over cook the baby corn, it should be just tender and retain some of the crunch. Yummy and creamy gravy!! Love the flavours!! The gravy looks so creamy and delicious.. Nice color too..
My latest favorite is baby corn! This looks tempting! This is really nice. I never knew there is an option of grinding capsicums in gravy. Totally new to me. Will try this and tell you how it turned out. Thanks Sona. Wow..looks so yummy..really inviting masala. The gravy looks so creamy and rich.. 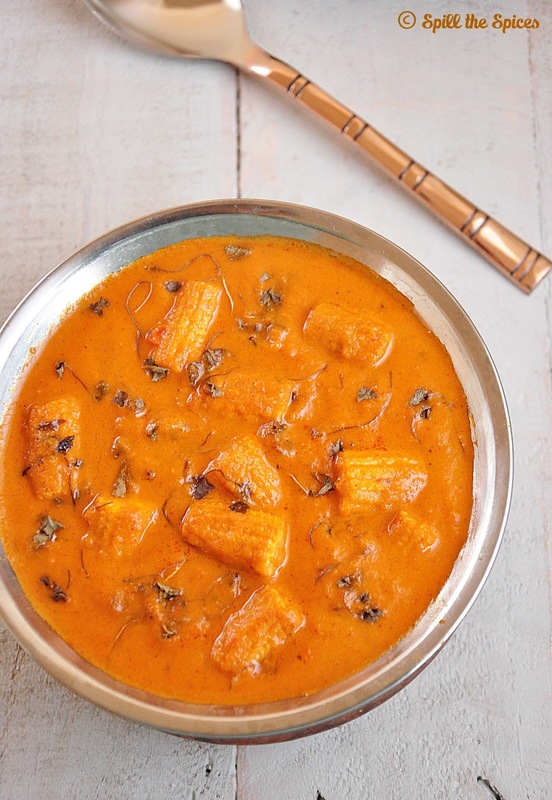 Delicious baby corn curry and inviting pics.. Delicious curry with baby corn. The gravy looks so creamy and really delicious. I ma sure it will be perfect with rice. I liked the idea of adding capsicum to give color and sweetness.. Next time will try it.. The curry looks very delicious..